Trees are commonly planted and managed at the watershed scale for various functions. Site-specific forest management with a view to reap the multiple services of available resources, on the other hand, remains rare and requires more attention in research and implementation. This was the main conclusion derived from UNU-FLORES’s organised session on “Multifunctional Plantation Management” at the 4th International Congress on Planted Forests (ICPF2018) in Beijing. From 23–27 October 2018, over 700 experts in forest ecology, economics, and policy from 66 countries gathered in the Chinese capital to discuss the experiences and lessons learned from plantation forests management and development in the drive towards sustainable greening. The Soil and Land-Use Management unit of UNU-FLORES was invited to co-organise a session to present the scientific research addressing the management of plantation forests emerging from the two projects conducted in cooperation with the Chinese Academy of Forestry (CAF) – Water-LUC (funded by the German Research Foundation) and MuLu. 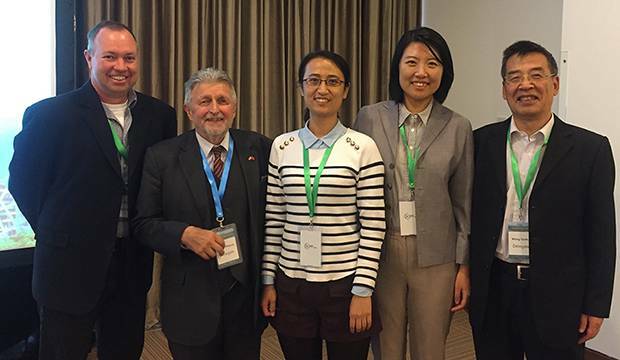 During the UNU-FLORES session, five speakers from Australia, Austria, China, and Germany presented cases of multifunctional plantation forest management in different countries. Forest management can be understood as the process aimed at maintaining and enhancing the economic, social, and environmental values of forests for human development and can be based on various objectives such as conservation or economics. 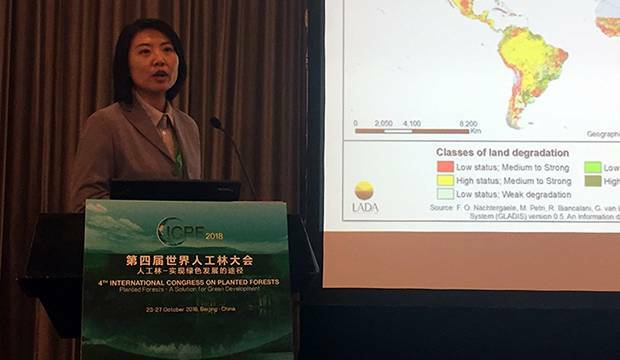 UNU-FLORES researcher Dr Lulu Zhang argued that forest management is needed to realise the multifunctionality of black locust plantation forests on the Loess Plateau of China. Under changing climate conditions, the management of protective plantation forests such as the black locust in the Loess region is critical in order to manage our environmental resources optimally. It also has significant impacts on ecosystem services that sustain lives. However, forest management is in fact less common in plantation forests that are established for ecological or protective purposes, unlike in the case of timber production, for example. However, the broader development of forest policy signals hope. In China, there has been a shift in national policies towards supporting increasing multifunctionality of plantation forests – efforts backed by UNU-FLORES through the joint research and cooperation with CAF, China’s national think tank. The State Forestry and Grassland Administration of China (SFGA) has announced a new decision for promoting green activities in the country. Supporting this decision, three priorities are highlighted as principles guiding forest management: consideration for the water-carrying capacity for vegetation, integrated management of water-forest-soil system, and improvement of stability and services of forest. This is a shift from the wave of afforestation programmes China had embarked on but that had produced mixed results so far. The successful implementation of any forest management would depend on learning from past lessons and the further development of detailed procedures and techniques for respective cases. Likewise, participants discussed lessons learned and knowledge gaps to be filled following every presentation at the session. The conference was organised by the International Union on Forest Research Organizations (IUFRO) with the technical support of the Food and Agriculture Organization of the United Nations (FAO). Zhang, Lulu. 2015. “North-west China Water Supply Impacted by Vegetation Restoration”. Our World. Available here.